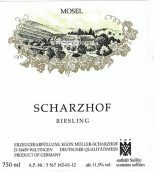 All Müller wines are Rieslings; “Scharzhof” is the property’s most accessible wine. “Scharzhof” is made utilizing grapes from Müller’s Saarburg and Wawern vineyards, and from the Wiltinger Braunfels and Wiltinger Kupp vineyards. This wine is a sterling introduction to Riesling and to the Egon Müller range. Extremely juicy and sweet. Layer upon layer of fruit interwoven with minerality. This is a very persistent wine from start to finish. "Enticing aromas of elderflower and saffron lead off, with an intriguing silky texture enveloping the apple, spice and mineral flavors of this white. Barely off-dry, this is harmonious and long, delivering a refreshing finish. A lovely sipper, but this would be a great complement to food as well. Drink now through 2029."